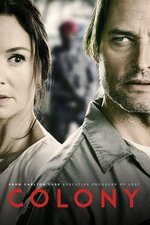 In occupied Los Angeles, Will attempts a daring rescue; Katie tries to help a relative in need; a job opportunity may divide a family. So, LA - and presumably other parts of the US/the world are under occupation by a mysterious, alien force referred to as the "hosts" about a year after "The Arrival". Will is a former special forces/FBI agent in hiding who attempts to smuggle himself through the wall that separates LA from Santa Monica to find his missing son, only to be caught up in a Resistance bombing, his cover blown, and recruited into infiltrating the Resistance. Katie, meanwhile, cares for their two other children and seeks out insulin to keep people alive. In the end, she accepts the fact that Will becomes a collaborator, while revealing to the audience that she is a member of the Resistance and will work as a double agent, providing information about Will's activities. Nothing original here I don't think - it draws heavily on stories of occupied Europe during WWII as well as some Cold War imagery (the Walls). But I was also reminded of shows such as V and the Americans, as well as games like X-Com 2. That being said, it might be pulling from a lot of sources, but the pilot seemed promising; lots of possible directions to choose from, and I think the show did itself a service by focusing on Will and Katie in the opening episode; there will be time to flesh out the other characters - the teenage son, the woman who came over, the members of the Resistance and the Proxy Governor - as the show moves forward. I particularly like the fact that while Will seems to be the straightforward, strong jawed conflicted male hero, Katie has more depth and is more interesting by the end of the first hour. (My wife also noted that Josh Hollaway is one of those actors who should just always keep his shirt on as she finds him significantly less attractive the moment it comes off). I've been plowing through this on Netflix, and I won't spoil anything except to say that it does get a bit broader in scope as the season goes along, but always centers on the couple. I'm particularly interested in stories of people like Will's partner - people who are not exactly collaborators, but are also not so committed as to join the Resistance for one reason or another. My daughter is amazed that Zack and Cody's mom is in it! Yeah, this comes from similar inspiration to V: America under fascist occupation. The authors of this specifically talked about Vichy France as one of the things they were looking at, IIRC. S2 is out? Hah! It just hit Netflix for me in the last couple of weeks, and I figured it looked like a good "I've got a bunch of ironing to do" screen fodder. So much content out there, it's like a firehose. For me at this point, the most intriguing thing is Katie's character and the decisions she is going to have to make; and yes, so far this seems much better than what Sarah was given on what I saw of Walking Dead. Netflix is generally about a year behind on TV that they didn't produce. Which mostly doesn't matter: as you say, there's so much good TV out now that it's hard to keep up. I would've watched him, but I was doing stuff. And things. I only saw this episode (and a while ago now), but I remember having concerns about the casting. Square jawed blond guy is the hero. Obviously Jewish guy has turned on humanity for personal gain. Am I being oversensitive? Didn't really like the uncertainty of the insulin thing. I know that's what these shows trade in, but I have a feeling there would be similar subplots that never get resolved one way or the other, but exist just to charge our emotions. Since you are all talking about it, I might give it another go and see what I think of episode 2. You are not completely off-base, the casting is not exemplary, but for a basic cable show it does a pretty good job of blurring the lines between good and evil as it goes along. There is a fair bit of heartstring-tugging (like the insulin and the missing son) but so far they have been adequately exploring the ramifications of most if not all of the subplots. It's worth a try. It's a slow burn on this front, but yes. This was the really striking thing for me. I was expecting the standard sort of action-drama yarn with a side dose of Cuse mystery-boxing, but it wound up being surprisingly complicated on the ethics of collaboration and resistance. Not that it's a particularly intellectual show or anything, just that it was better than it needed to be. Square jawed blond guy is the hero. Obviously Jewish guy has turned on humanity for personal gain. Am I being oversensitive? No, that's a fair point - Proxy Snyder could've been cast more thoughtfully, and we could always do with more protagonists who are not cis het white men. That said, tobascodagama is correct: this show does a reasonable job of examining how everyone involved is morally compromised by having to live in an authoritarian state, regardless of background, skills or character. Nobody gets away clean, and the show is reasonable about presenting that. It's not genius or must-see, but 'better than it needed to be' is a pretty fair assessment. Compared to most sci-fi out there, it's pretty damn great. As far as the casting goes, I give them a pass since at least there are a reasonable amount of people of color in major roles, or at least plot-important roles. I've been waiting for season 2 and I'm so glad it's back. I watched the first season and it's worth discussing (it's SF!) and the conspiracy convolutions are better than many, but the initiating trigger seemed weak. The star is a street smart ex-FBI agent. Now if he's destitute and doing a suicide mission for the suicide I'd expect a more broken soul. If it's not blind attempt to cross the wall and there is regular black market/rebel traffic I'd expect that he would have done more preparation and have knowledge about the sitrep on the other side. It seems like the writers worked out an elaborate world and got to the first day of filming and realized they needed an emotional initiating trigger and threw something together. I loved the first season of this show but am concerned that Will's simply TOO good at his job, kinda like Ben/Aaron on Incorporated. Thanks for posting this, I nearly forgot S2 is upon us! I generally hate political spy thriller shows because they devolve into "same old, same old" and don't have the blockbuster budgets or special effects that films do in this genre, but between the V callbacks and the very timely 1984 surveillance state/dystopian atmosphere, it's definitely one to watch. I watched this episode back when it originally aired and about half of the next before deciding it didn't compel me enough to make up for the slower pace (and my parental limited time grudge against adding more hour-long shows to my viewing habits). Do the focal characters manage to get you more interested in their individual plight and choices? I recall thinking that without feeling more connected to them it was mostly like just soaking in some grimness with few details about the larger goings-on. I'm about halfway through now, phearlez, and I think that is still a good question; I think Katie is still the far more interesting character because her ideals are facing more challenges as she continues on her path. Will is Will; while he has some moments of doubt in what he is doing, they aren't very strong or long-lasting. The show seems to be exploring the difficult choices everyone is facing more with some of the secondary characters than the main pair. Phearlez one thing I DO like is that the series gives at least one character development episode/arc to almost every single character with a speaking role in the show, and even various children help propel the plot forward. It's not an ideal show by any means, but there's a subplot involving how humans in management positions have a slightly different view of the hosts and I'm still pretty intrigued by that development. It's a slow burn for sure, but on the plus side, you can pick it back up anytime without having to binge-watch just to avoid tons of spoilers. It's not like The OA, for example, and I do appreciate having that flexibility. This show ended up being pretty darned good. It has its flaws, but it's a pretty complex web of domains of understanding, interesting worldbuilding, a little bit of viva la resistance, interspersed with reasonable action, but I got caught up with the trying to "figuring out what the heck is going on." The second season starts very strongly.